People who use MDID as their presentation tool sometime want text slides as part of their slideshows. It is not possible to create these in MDID, but they can be created in PowerPoint, exported in a specific way, and added to MDID. 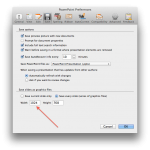 Start by adjusting a setting in your PowerPoint preferences. 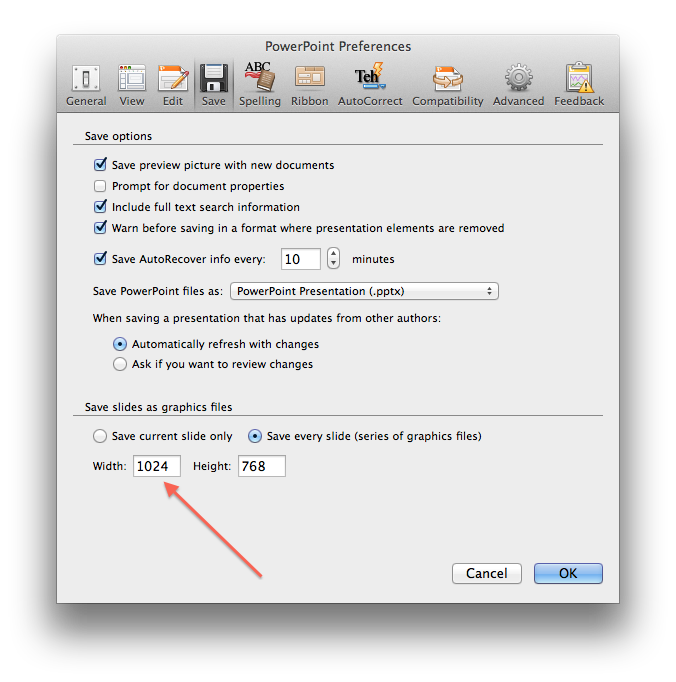 In the Mac version of PowerPoint, select the Save tab in preferences. At the bottom of the window are two boxes for adjusting the size of exported images. The default is fairly small, so change the width to at least 1024 (the height will automatically adjust). See the first screenshot below; click it for a larger image. Create the text slides in PowerPoint; be sure to use a black background with white text. Save the slideshow normally, and then do a Save As. Select a location such as your desktop and choose the format BMP (see the second screenshot below; click for larger image). 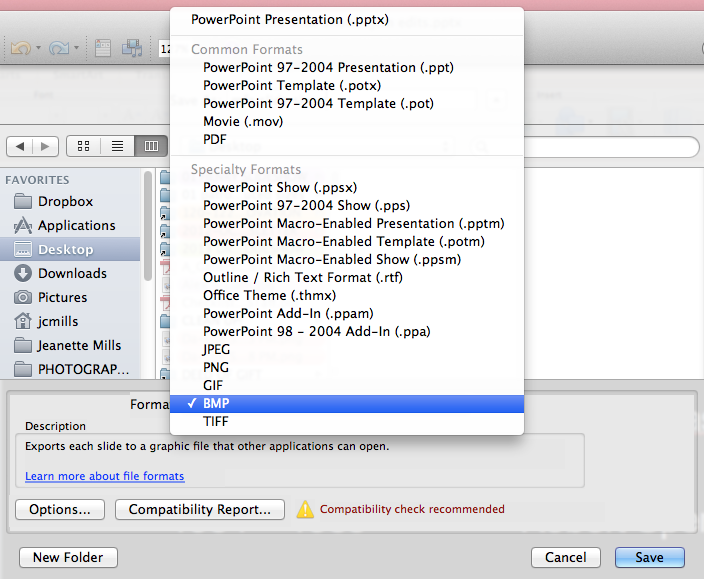 When you click the Save button, PowerPoint will save each slide as an individual file in a folder with the same name as the slideshow. You can then add each text slide to your My Images area in your soaMDID account. Be sure to give each slide at least a title so that you are able to find it more easily in the future. The images of these text slides can then be added to any of your MDID slideshows just like any other image. 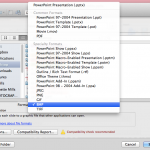 This entry was posted on Thursday, May 30th, 2013 at 10:52 am and is filed under PowerPoint, soaMDID, Tips about soaMDID. You can follow any responses to this entry through the RSS 2.0 feed. Both comments and pings are currently closed.